Today is Rwagasore Day in Burundi, commemorating the day in 1961 when crown prince Louis Rwagasore, prime minister of Burundi, was assassinated shortly before Burundian independence. The investigation into his murder was clearly mismanaged by the Belgian authorities, in charge at the time. Many believe that the mismanagement was deliberate because the Belgian government was involved in the assassination. Louis Rwagasore was the son of Mwami (king) Mwambutsa IV and his first wife, Thérèse Kayonga. He attended Groupe Scolaire d’Astrida (now Groupe Scolaire Officiel de Butare) in Rwanda. He briefly attended university in Belgium, but left to spearhead his country’s anti-colonial movement. He founded a series of African cooperatives to encourage economic independence, but these were quickly banned by Belgium in 1958. 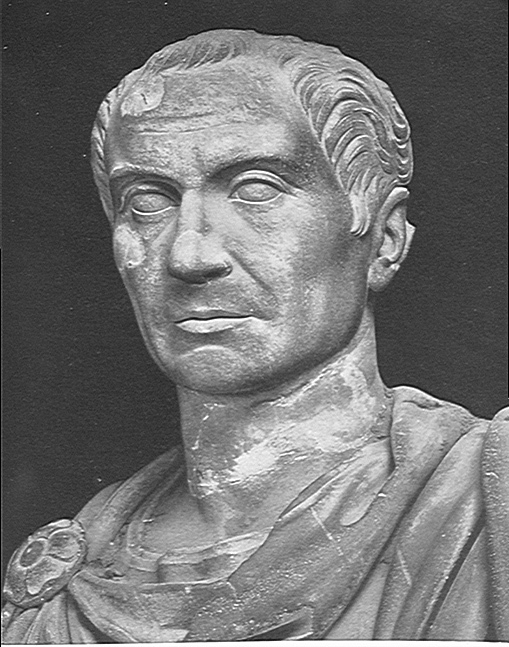 That same year he established a nationalist political movement, Union for National Progress (UPRONA). Believing that the royal family should transcend partisan politics, his father promoted him to Chief of Butanyerera, but Rwagasore turned down the appointment so that he could devote himself fully to the nationalist cause. Rwagasore, a Ganwa (a royal kinship group identified with Tutsi), married a woman who most people thought was a Hutu. It is believed that Rwagasore did so in a bid to play down the ethnic divisions between ethnic groups, especially between Tutsi and Hutu, which he believed the Belgian colonial rule had pitched against one another. 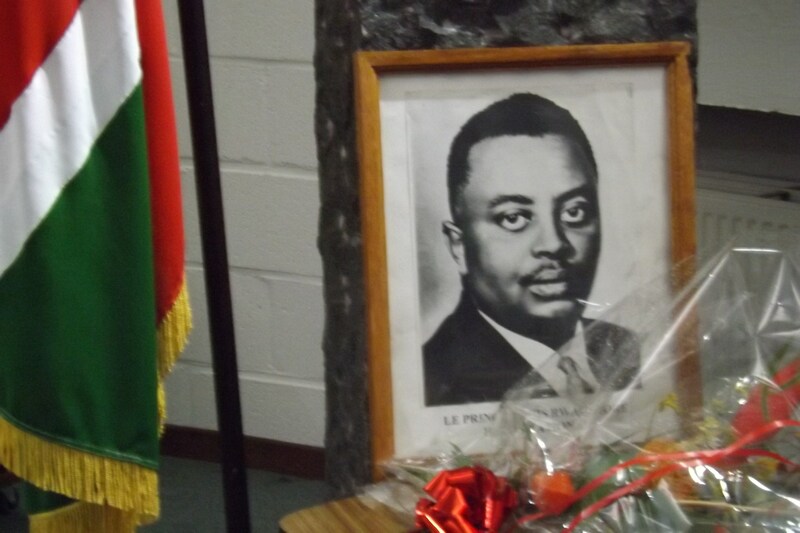 At the first UPRONA Congress in March 1960, Rwagasore demanded complete independence for Burundi and called on the local population to boycott Belgian stores and refuse to pay taxes. Because of these calls for civil disobedience, he was placed under house arrest. Just two weeks later, on 13th October 1961, Rwagasore was assassinated while dining at the Hotel Tanganyika in Usumbura (modern-day Bujumbura). The assassin, a Greek national named Jean Kageorgis, was accompanied by three Burundians, all members of the pro-Belgian Christian Democratic Party (PDC). Within three days, all four suspects were arrested and they quickly implicated two high-ranking members of the PDC (Jean-Baptiste Ntidendereza and Joseph Biroli), with one initially admitting his guilt but later retracting his confession. 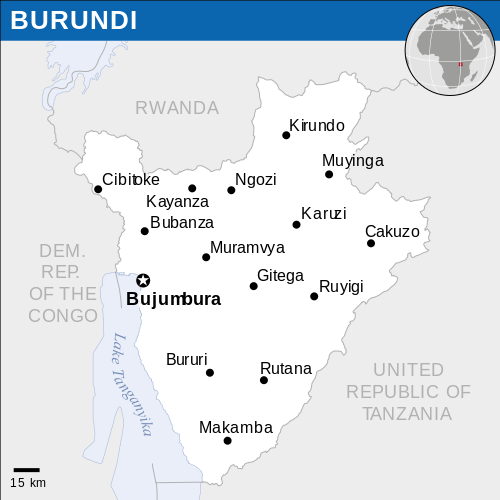 Following the assassination inter-ethnic rivalries between the Hutu and Tutsi within UPRONA flared. Historians have suggested that the Belgian colonial authorities may have played a significant role in the assassination although no official inquiry has ever been carried out. 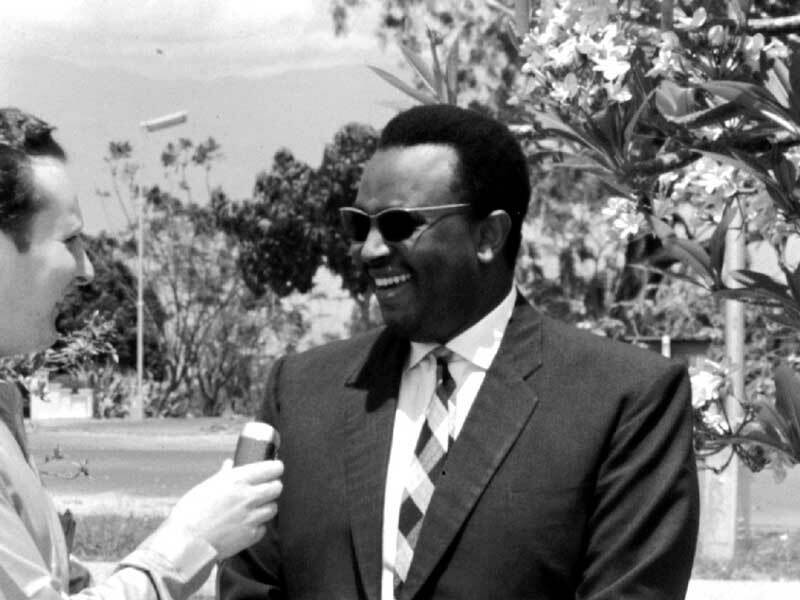 As early as the 1970s, René Lemarchand, an expert on Burundian history, claimed that the PDC’s European secretary, Ms. Belva, was told by the Belgian regent Roberto Régnier that “Rwagasore must be killed.” In addition, several days before his assassination, Rwagasore filed a complaint against seven Belgian officials including the Belgian Governor-General, Jean-Paul Harroy and Régnier. Before being executed for the murder, Kageorgis explicitly accused Harroy and Régnier of responsibility. 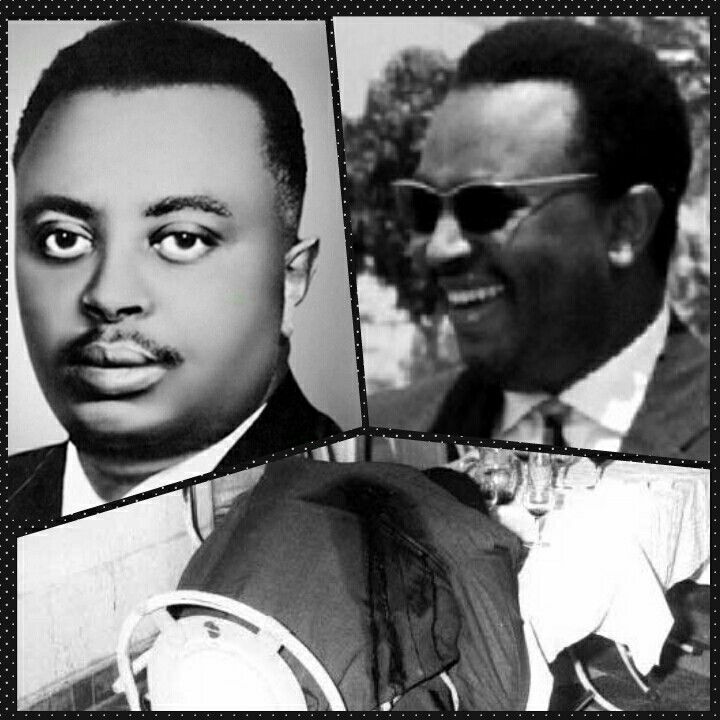 In 2011 the Belgian journalist, Guy Poppe, published De moord op Rwagasore, de Burundese Lumumba (The Death of Rwagasore, the Burundian Lumumba) which claimed that irregularities in the investigation of the prince’s murder included, among other details, a lack of questioning of witnesses including Harroy, Régnier, Kageorgis’ Belgian fiancée, and Ms. Belva. Poppe discovered that files from the Belgian Ministry of Foreign Affairs’s archives, including a transcript from an interview that was conducted with Régnier following his return to Belgium from Burundi, had been lost. Poppe also claimed that the Foreign Ministry had threatened to fire three former colonial officers if they traveled to Burundi in order to testify during Kageorgis’ trial. Poppe noted the investigation’s failure to follow up links between the Burundian PDC party and the Belgian Christian Social Party (PSC-CVP). 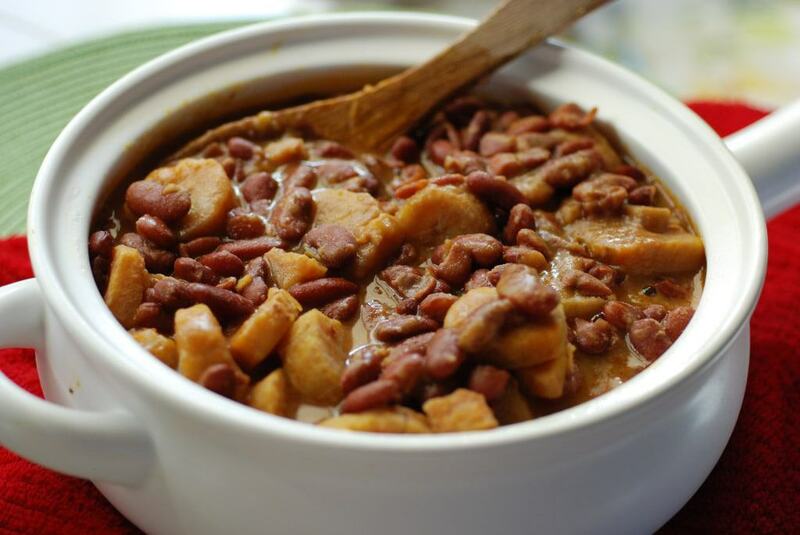 Red kidney beans are the dominant staple in Burundian cooking. Also used commonly are corn, bananas, plantains, sweet potatoes, cassava, peas, and manioc. 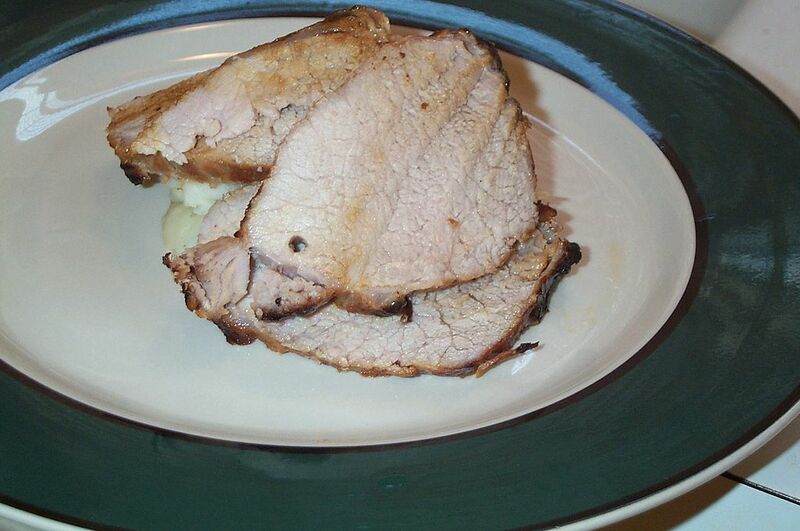 Some lamb and mutton is used, but it is not common, nor are cooked desserts. 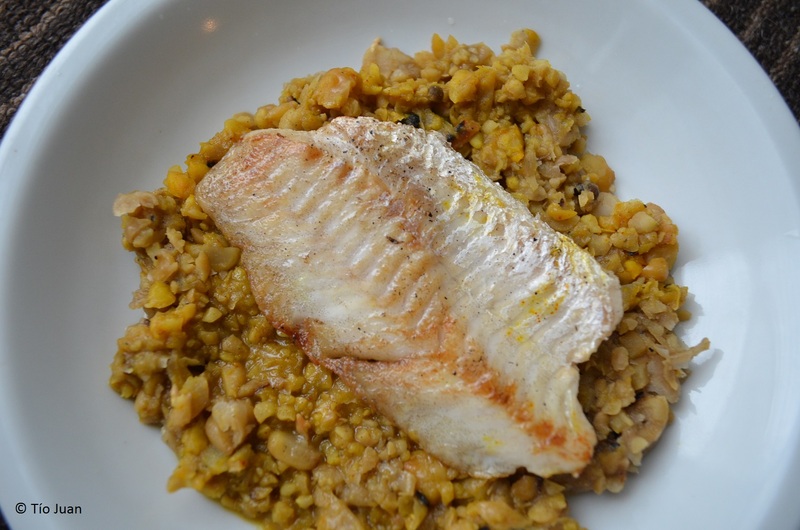 On the whole, the recipes are relatively plain and simple. 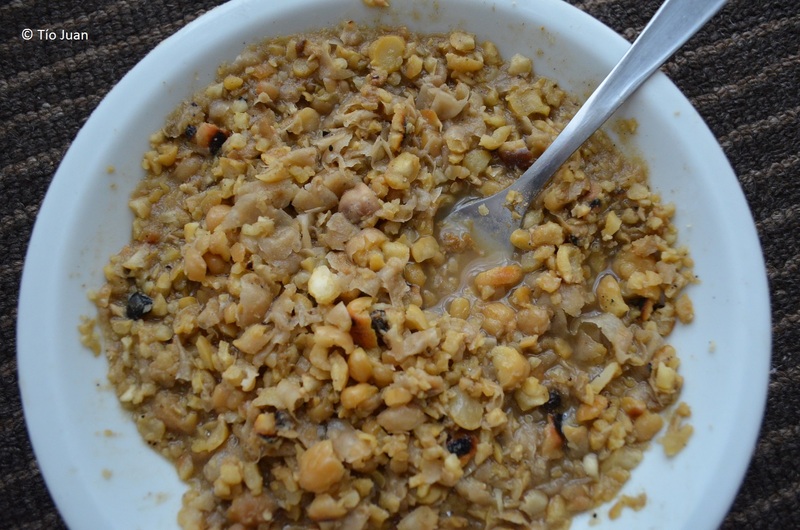 Here is a recipe for Burundi beans and bananas. Soak the beans in cold water for at least 3 hours, or overnight. 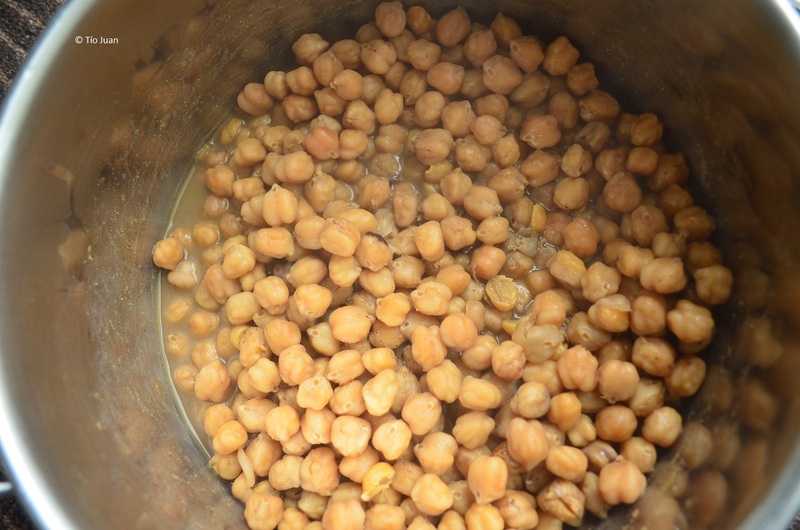 Drain the beans, place them in a saucepan, cover with water, bring to a boil, and then simmer for 45 minutes. Drain. Heat the palm oil in a large, deep skillet over medium-high heat. Add the onions and fry until uniformly golden-brown, stirring often. Add the beans and bananas, season with salt and red pepper to taste and continue frying for 2 minutes. 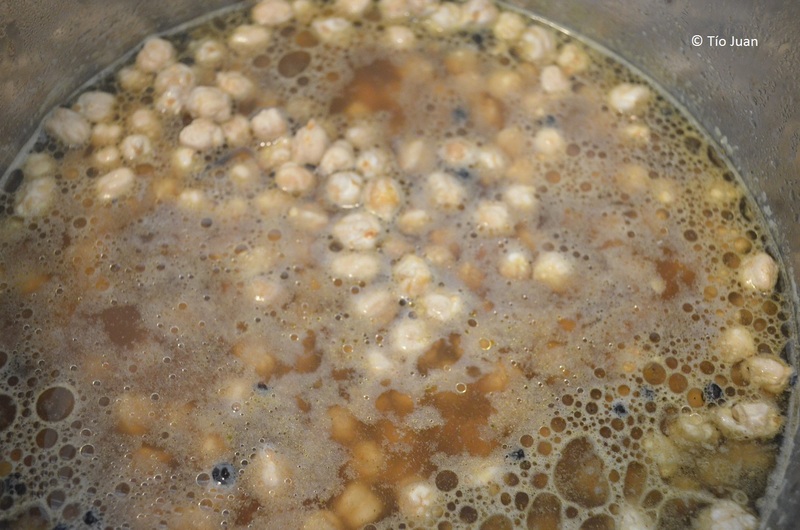 Cover with water and let the beans and bananas simmer until the water has reduced and thickened considerably. Serve hot. 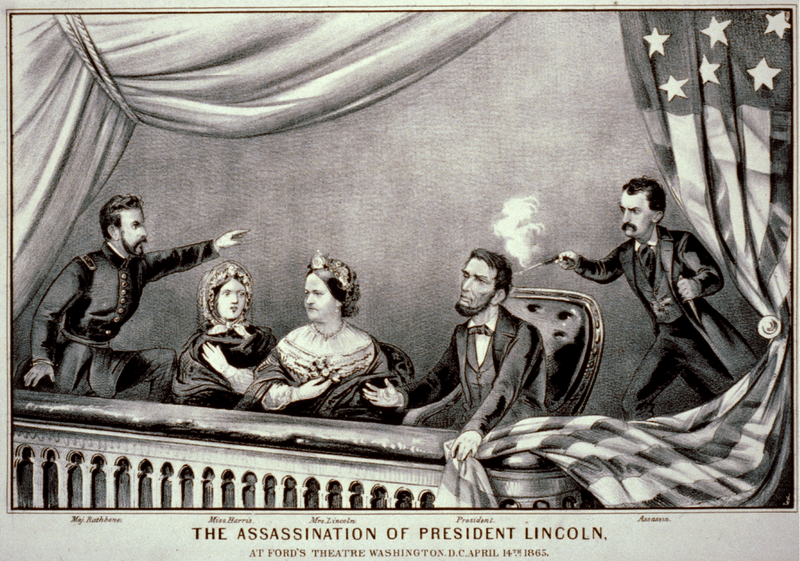 United States President Abraham Lincoln was mortally shot on Good Friday, April 14, 1865, while attending the play Our American Cousin at Ford’s Theatre as the American Civil War was drawing to a close. The assassination occurred five days after the commander of the Confederate Army of Northern Virginia, General Robert E. Lee, surrendered to Lieutenant General Ulysses S. Grant and the Union Army of the Potomac. Booth’s three co-conspirators were Lewis Powell and David Herold, who were assigned to kill Secretary of State William H. Seward, and George Atzerodt who was asked to kill Vice President Andrew Johnson. By simultaneously eliminating the top three people in the administration, Booth and his co-conspirators hoped to sever the continuity of the United States government. Lincoln was shot and died early the next morning. The rest of the conspirators’ plot failed; Powell only managed to wound Seward, while Atzerodt, Johnson’s would-be assassin, lost his nerve and fled. The funeral and burial of Lincoln was a period of national mourning. In late 1860, Booth had been initiated in the pro-Confederate Knights of the Golden Circle in Baltimore. In March 1864, Ulysses S. Grant, the commanding general of all the Union’s armies, decided to suspend the exchange of prisoners-of-war. As harsh as it may have been on the prisoners of both sides, Grant realized the exchange was prolonging the war by returning soldiers to the outnumbered and manpower-starved South. John Wilkes Booth, a Southerner and outspoken Confederate sympathizer, conceived a plan to kidnap President Lincoln and deliver him to the Confederate Army, to be held hostage until the North agreed to resume exchanging prisoners. Booth recruited Samuel Arnold, George Atzerodt, David Herold, Michael O’Laughlen, Lewis Powell (also known as “Lewis Paine”), and John Surratt to help him. Surratt’s mother, Mary Surratt, left her tavern in Surrattsville, Maryland, and moved to a house in Washington, D.C., where Booth became a frequent visitor. On March 17, 1865, Booth informed his conspirators that Lincoln would be attending a play, Still Waters Run Deep, at Campbell Military Hospital. He assembled his men in a restaurant at the edge of town, intending that they should soon join him on a nearby stretch of road in order to capture the President on his way back from the hospital. But Booth found out that Lincoln had not gone to the play after all. Instead, he had attended a ceremony at the National Hotel in which officers of the 142nd Indiana Infantry presented Governor Oliver Morton with a captured Confederate battle flag. Meanwhile, the Confederacy was falling apart. On April 3, Richmond, Virginia, the Confederate capital, fell to the Union army. On April 9, 1865, the Army of Northern Virginia, the main army of the Confederacy, surrendered to the Army of the Potomac at Appomattox Court House. Confederate President Jefferson Davis and the rest of his government were in full flight. Despite many Southerners giving up hope, Booth continued to believe in his cause. On April 14, 1865, Booth’s morning started at the stroke of midnight. 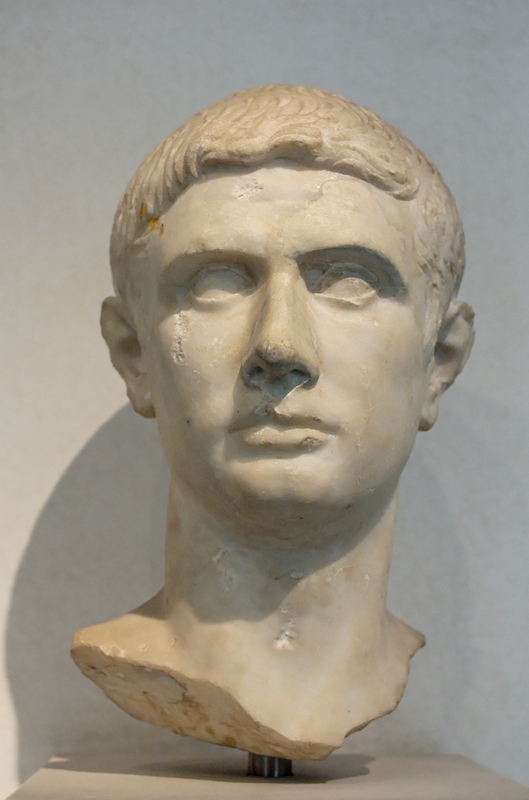 Lying wide awake in his bed at the National Hotel, he wrote his mother that all was well, but that he was “in haste”. 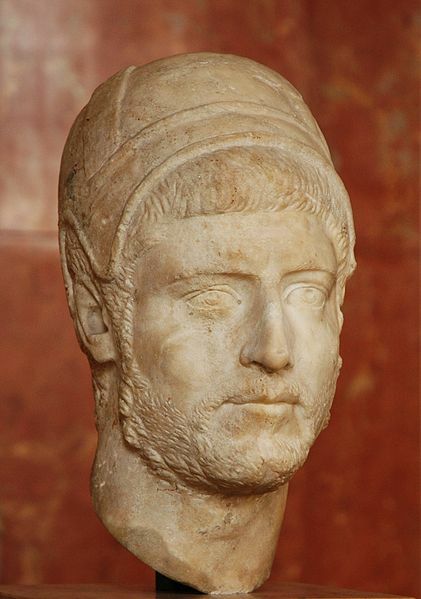 In his diary, he wrote that “Our cause being almost lost, something decisive and great must be done”. Lincoln’s day started well for the first time in a long time; he woke up cheerful. Senator James Harlan remembered taking a drive with the Lincolns only days before the president’s assassination, and found him transformed. “His whole appearance, poise and bearing had marvelously changed. He was, in fact, transfigured. That indescribable sadness which had previously seemed to be an adamantean element in his very being, had been suddenly exchanged for an equally indescribable expression of serene joy as if conscious that the great purpose of his life had been achieved.” Hugh McCulloch, the new Secretary of the Treasury, remarked that on that morning, “I never saw Mr. Lincoln so cheerful and happy”. Edwin M. Stanton said: “At the earliest moment yesterday, the President called a cabinet meeting, at which Gen. Grant was present. He was more cheerful and happy than I had ever seen him. He rejoiced at the near prospect of a firm and durable peace at home and abroad, which manifested in a marked degree the soundness and honesty of his disposition, and the tender and forgiving spirit that so eminently distinguished him.” No one could miss the difference. For months, the President had looked pale and haggard. Lincoln himself told people how happy he was. 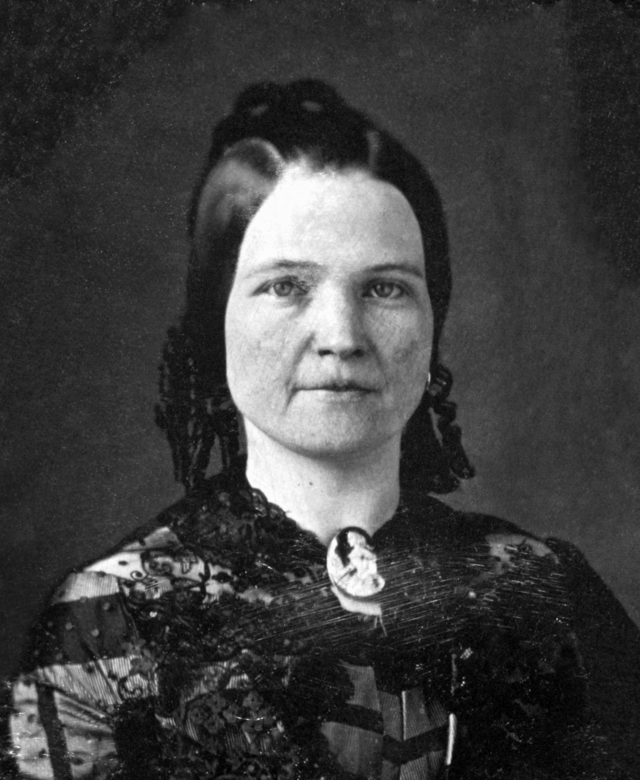 This caused First Lady Mary Todd Lincoln some concern, as she believed that saying such things out loud was bad luck. Lincoln paid her no heed. Lincoln told members of his cabinet that he had dreamed that he was on a “singular and indescribable vessel that was moving with great rapidity toward a dark and indefinite shore.” He also revealed that he’d had the same dream repeatedly on previous occasions, before “nearly every great and important event of the War” such as the victories at Antietam, Murfreesboro, Gettysburg and Vicksburg. At around noon while visiting Ford’s Theatre to pick up his mail (Booth had a permanent mailbox there), Booth learned from the brother of John Ford, the owner, that the President and General Grant would be attending the theatre to see Our American Cousin that night. Booth determined that this was the perfect opportunity for him to do something “decisive”.He knew the theater’s layout, having performed there several times, as recently as the previous month. That same afternoon, Booth went to Mary Surratt’s boarding house in Washington, D.C. and asked her to deliver a package to her tavern in Surrattsville, Maryland. 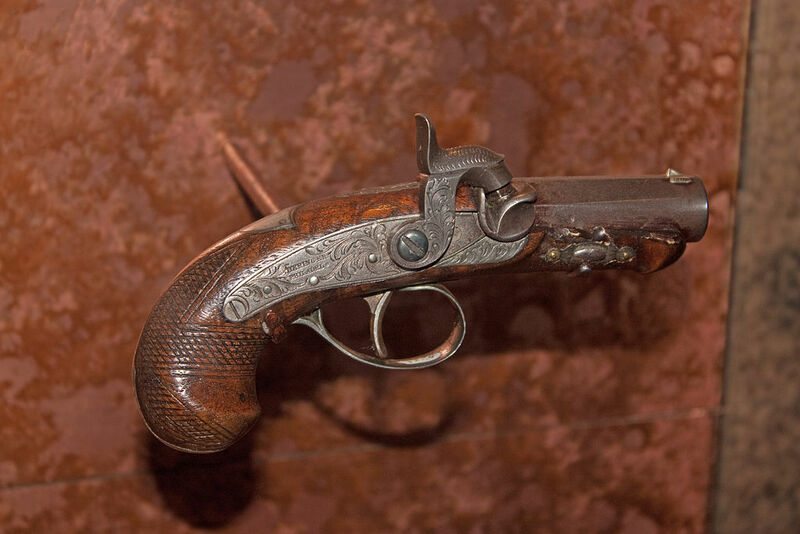 He also requested Surratt to tell her tenant who resided there to have the guns and ammunition that Booth had previously stored at the tavern ready to be picked up later that evening. She complied with Booth’s requests and made the trip, along with Louis J. Weichmann, her boarder and son’s friend. This exchange, and her compliance in it, would lead directly to Surratt’s execution three months later. 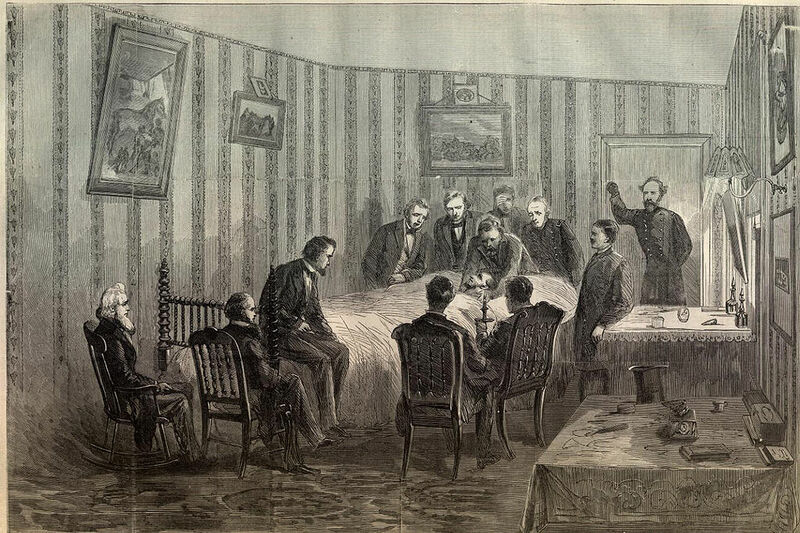 At seven o’clock that evening, John Wilkes Booth met for a final time with all his fellow conspirators. Booth assigned Lewis Powell to kill Secretary of State William H. Seward at his home, George Atzerodt to kill Vice President Andrew Johnson at his residence, the Kirkwood Hotel, and David E. Herold to guide Powell to the Seward house and then out of Washington to rendezvous with Booth in Maryland. 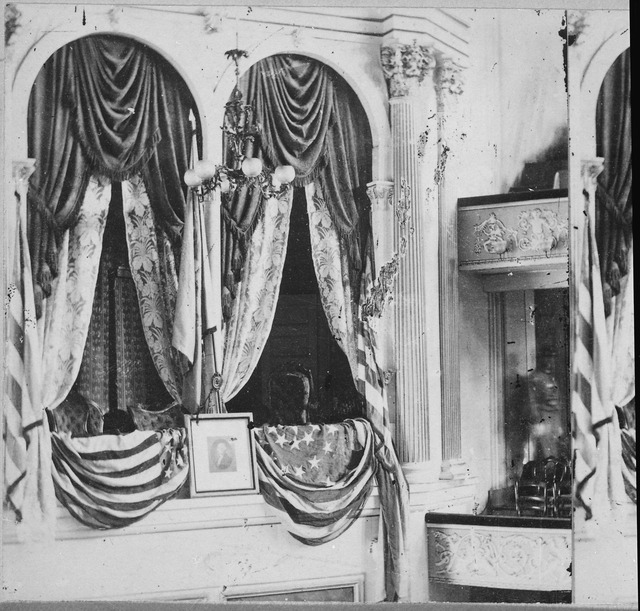 Booth planned to shoot Lincoln with his single-shot Deringer and then stab Grant with a knife at Ford’s Theatre. They were all to strike simultaneously shortly after ten o’clock that night. Atzerodt wanted nothing to do with it, saying he had only signed up for a kidnapping, not a killing. Booth told him he was in too far to back out. Contrary to the information Booth had overheard, General and Mrs. Grant had declined the invitation to see the play with the Lincolns, as Mrs. Lincoln and Mrs. Grant were not on good terms. Several other people were invited to join them, until finally Major Henry Rathbone and his fiancée Clara Harris (daughter of New York Senator Ira Harris) accepted. Lincoln told Speaker Schuyler Colfax, “I suppose it’s time to go though I would rather stay.” He assisted Mary into the carriage and they took off. The box was supposed to be guarded by a policeman named John Frederick Parker who, by all accounts, was a curious choice for a bodyguard. During the intermission, Parker went to a nearby tavern with Lincoln’s footman and coachman. 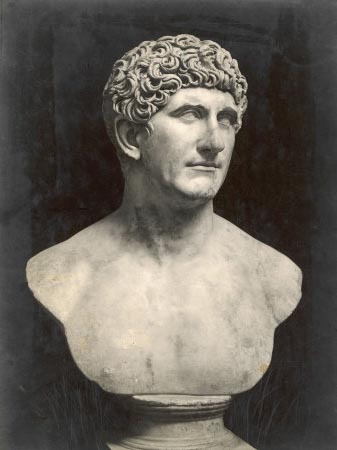 It is unclear whether he ever returned to the theatre, but he was certainly not at his post when Booth entered the box. 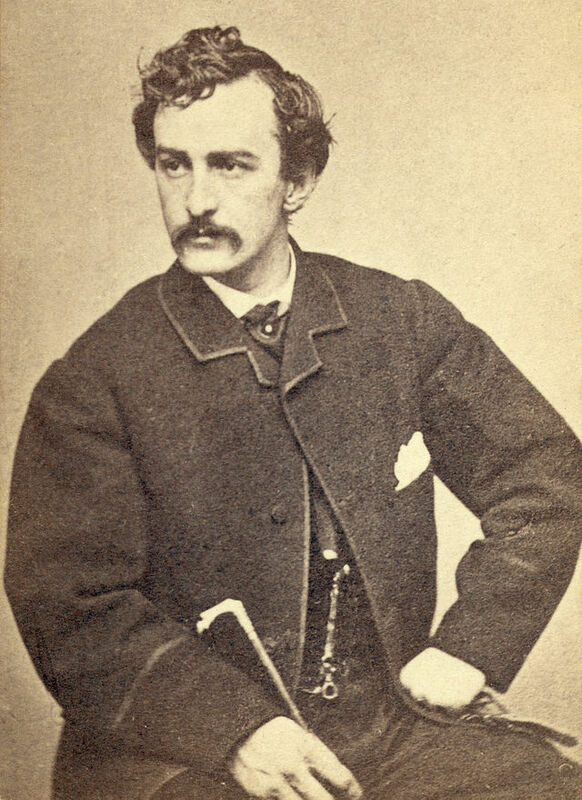 Nevertheless, even if a policeman had been present it is questionable at best as to whether he would have denied entry to the Presidential Box to a premier actor such as John Wilkes Booth – Booth’s celebrity status meant that his approach did not warrant any questioning from audience members, who assumed he was coming to call on the President. 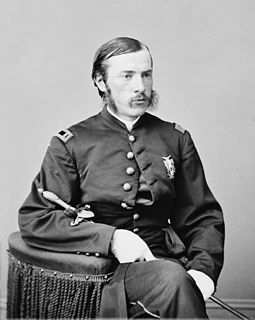 Dr. George Brainerd Todd, a Navy Surgeon who had been aboard when the Lincolns visited his ship the monitor Montauk on April 14, was also present at Ford’s Theatre that evening and wrote in an eyewitness account. About 10:25 pm, a man came in and walked slowly along the side on which the “Pres” box was and I heard a man say, “There’s Booth” and I turned my head to look at him. He was still walking very slow and was near the box door when he stopped, took a card from his pocket, wrote something on it, and gave it to the usher who took it to the box. In a minute the door was opened and he walked in. Upon gaining access through the first door of the entry to the Presidential Box, Booth barricaded the inward-swinging door behind him with a wooden stick that he wedged between the wall and the door. He then turned around, and looked through the tiny peep-hole he had carved in the second door (which granted entry to the Presidential Box) earlier that day. Although he had never starred in the play itself, Booth knew the play by heart, and thus waited for the precise moment when actor Harry Hawk (playing the lead role of the “cousin”, Asa Trenchard), would be on stage alone to speak what was considered the funniest line of the play. Booth hoped to employ the enthusiastic response of the audience to muffle the sound of his gunshot. With the stage to himself, Asa (Hawk) responded to the recently departed Mrs. Mountchessington, “Don’t know the manners of good society, eh? Well, I guess I know enough to turn you inside out, old gal; you sockdologizing old man-trap!” Hysterical laughter began permeating the theatre. Lincoln was laughing at this line when he was shot. Booth opened the door, crept forward and shot the President at point-blank range, mortally wounding him. The bullet struck the back of Lincoln’s head behind his left ear, entered his skull, fractured part of it badly and went through the left side of his brain before lodging just above his right eye almost exiting the other side of his head. Lincoln immediately lost consciousness. Lincoln slumped over in his rocking chair, and then backward. Mary reached out, caught him, and then screamed when she realized what had happened. Upon hearing the gunshot, Rathbone thought Booth shouted a word that sounded like “Freedom!” He quickly jumped from his seat and tried to prevent Booth from escaping, grabbing and struggling with him. Booth dropped the pistol on the floor and drew a knife, stabbing the major violently in the left forearm and reaching the bone. Rathbone quickly recovered and again tried to grab Booth as he was preparing to jump from the sill of the box. He grabbed onto Booth’s coat causing Booth to vault over the rail of the box down to the stage below (about a twelve-foot drop). In the process, Booth’s right boot struck the framed engraving of Washington, turning it completely over and his riding spur became entangled on the Treasury flag decorating the box, and he landed awkwardly on his left foot. He raised himself up despite the injury and began crossing the stage, making the audience believe that he was part of the play. 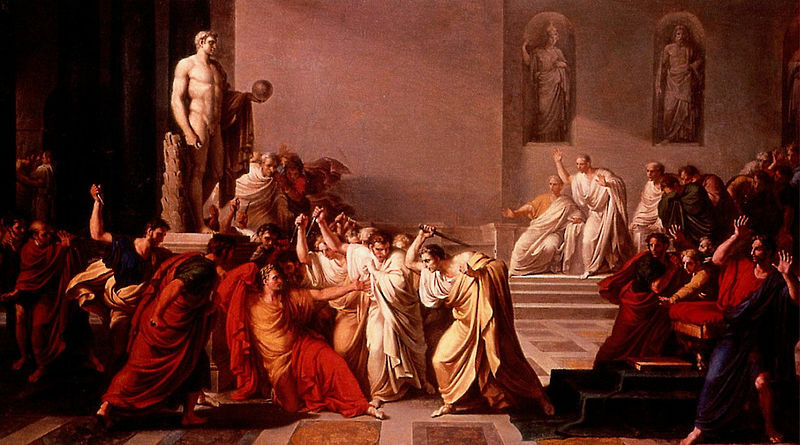 Booth held his bloody knife over his head, and yelled something to the audience. While the audience was yet to realize what had happened, Maj. Joseph B. Stewart, a lawyer, rose instantly upon seeing Booth land on the stage and he climbed over the orchestra pit and footlights, and started pursuing Booth across the stage. Mary Lincoln’s and Clara Harris’ screams and Rathbone’s cries of “Stop that man!” caused the rest of the audience to realize that Booth’s actions were not part of the show, and pandemonium immediately broke out. Some of the men in the audience chased after him when they noticed what was going on, but failed to catch him. Booth ran across the stage just when Rathbone shouted and exited out the side door. On his way, he bumped into William Withers, Jr., the orchestra leader, and Booth stabbed at Withers with a knife. Upon leaving the building, Booth approached the horse he had waiting outside. Booth struck Joseph “Peanuts” (also called “Peanut Johnny”) Burroughs, who was holding Booth’s horse in the forehead with the handle of his knife, leaped on to the horse, apparently also kicking Burroughs in the chest with his good leg, and rode away. Katherine M. Evans, a young actress in the play, who was offstage in Ford’s green room when Lincoln was shot, rushed on the stage after Booth’s exit, and said in subsequent interviews in the 1900s “I looked and saw President Lincoln unconscious, his head dropping on his breast, his eyes closed, but with a smile still on his face”. Charles Leale, a young Army surgeon doctor on liberty for the night, and attending the play, made his way through the crowd to the door at the rear of the Presidential box when he saw Booth finish his performance to the audience and saw the blood on Booth’s knife. The door would not open. Finally, Rathbone saw a notch carved in the door and a wooden brace jammed there to hold the door shut. Rathbone shouted to Leale, who stepped back from the door, allowing Rathbone to remove the brace and open the door. Leale entered the box to find Rathbone bleeding profusely from a deep gash in his chest that ran the length of his upper left arm as well as a long slash in his arm. Nonetheless, he passed Rathbone by and stepped forward to find Lincoln slumped in his chair, held up by Mary, who was sobbing and could not control herself. The President was paralyzed, and barely breathing. Leale lowered the President to the floor believing that Lincoln had been stabbed in the shoulder with the knife. A second doctor in the audience, Charles Sabin Taft, was lifted bodily from the stage over the railing and into the box. Leale, Taft, and another doctor from the audience, Albert King, quickly consulted and decided that while the President must be moved, a bumpy carriage ride across town to the White House was out of the question. After briefly considering Peter Taltavull’s Star Saloon next door, they chose to carry Lincoln across the street and find a house. The three doctors and some soldiers who had been in the audience carried the President out the front entrance of Ford’s Theatre. One of the soldiers who carried the President, was William Hall, a grocer, who originated from North East England, who, during the civil war originally signed up for the 12th Illinois Cavalry. 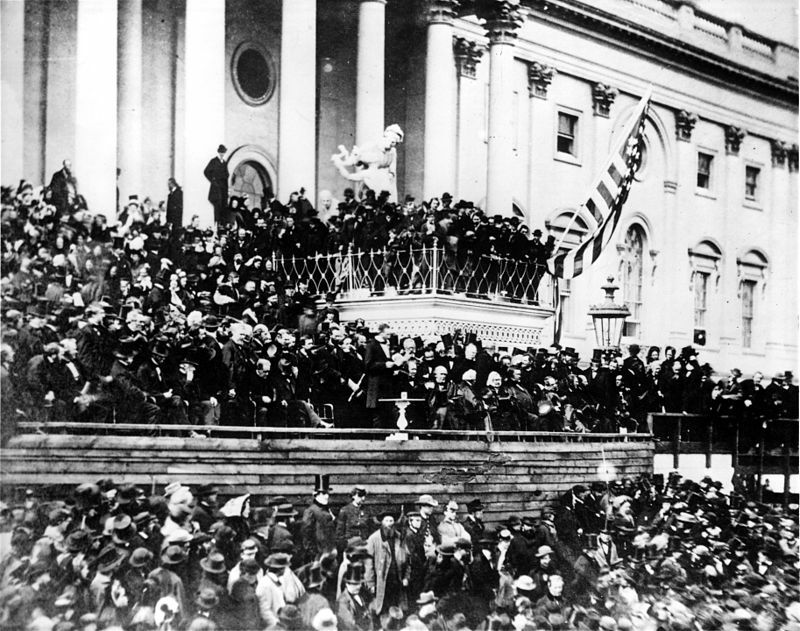 Rain fell down upon the crowd that carried Lincoln outside the theater. Across the street, a man was holding a lantern and calling “Bring him in here! Bring him in here!” The man was Henry Safford, a boarder at William Petersen’s boarding house known today at the Petersen House. The men carried Lincoln into the boarding house and into the first-floor bedroom where they laid him diagonally across the bed because his tall frame would not fit normally on the smaller bed. A vigil began at the Petersen House. The three physicians were joined by Surgeon General of the United States Army Joseph K. Barnes, Charles Henry Crane, Anderson Ruffin Abbott, and Robert K. Stone. Using a probe, Barnes located some fragments of Lincoln’s skull and discovered the bullet was still in his skull. Crane was a major and Barnes’ assistant. Stone was Lincoln’s personal physician. Robert Lincoln, home at the White House that evening, arrived at the Petersen House after being told of the shooting at about midnight. Tad Lincoln, who had attended Grover’s Theatre to see Aladdin and the Wonderful Lamp, was not allowed to go to the Petersen House, although he was at Grover’s Theatre when the play was interrupted to report the news of the President’s assassination. Lincoln died at 7:22:10 a.m. on April 15, 1865. He was 56 years old. 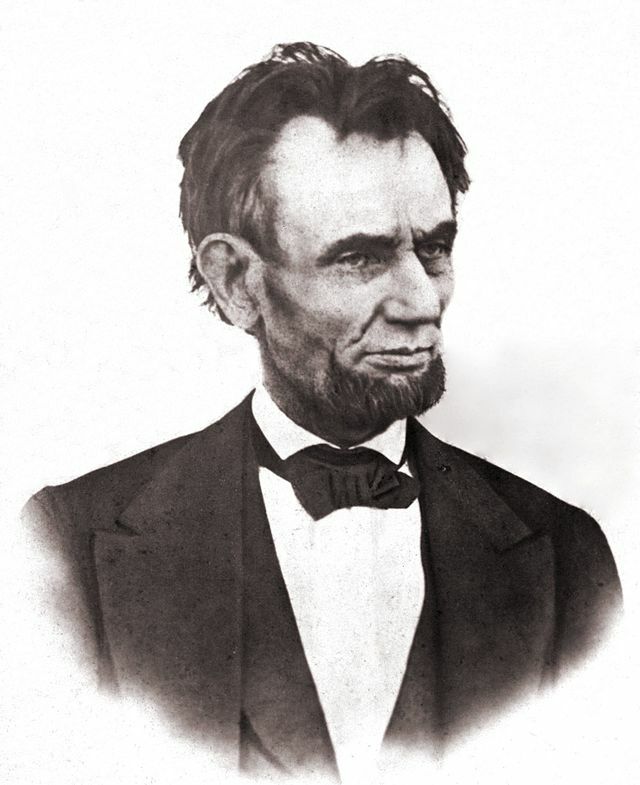 According to Lincoln’s secretary John Hay, at the moment of Lincoln’s death, “a look of unspeakable peace came upon his worn features”. Mary Lincoln was not present at the time of his death and neither were his children.The crowd around the bed knelt for a prayer. When they were finished, Stanton made a statement, though there is some disagreement among historians as to what exactly the statement was. All agree that he began “Now he belongs to the …” with some stating he finished with ages while others believe he finished with angels. Hermann Faber, an Army medical illustrator, was brought into the room immediately after Lincoln’s body was removed so that Faber could visually document the scene. Though some experts have disagreed, Dr. Leale’s treatment of Lincoln has been considered good for its time. He was honored for his efforts to save the President by participating in various capacities during the funeral ceremonies. There are reports attributable to President Lincoln that this cake of his wife’s was the best he ever ate…This delicious cake was the invention of Monsieur Giron, a Lexington [KY] caterer, who created it in honor of the visit to that city in 1825 of his fellow Frenchman, Lafayette. The Todd family acquired the recipe and cherished it ever after. The baking powder must have been added at a later date. Cream together 2 cups sugar with 1 cup butter. Sift 3 cups flour and 3 teaspoons baking powder three times and add to the butter-sugar mixture alternately with 1 cup milk. Chop 1 cup blanched almonds until very fine and add them to the mixture. Beat vigorously, then fold in 6 stiffly beaten egg whites carefully. Add 1 teaspoon vanilla, then fold in 6 stiffly beaten egg whites carefully. Add 1 teaspoon vanilla (almond extract if you prefer) and pour the mixture into a greased and floured angel-cake pan. Bake in a a preheated moderate (350 degree F.) oven for approximately 1 hour, or until a toothpick comes out clean when inserted into the cake’s center. Turn the cake out on a wire rack and allow to cool before frosting it. This makes a very large cake. 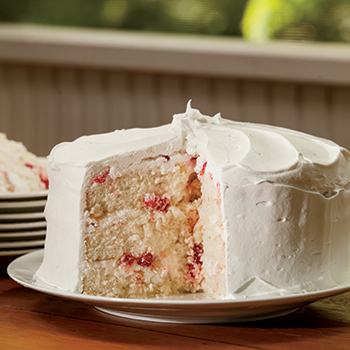 If you prefer, you can bake it in 2 9-inch layer-cake pans. 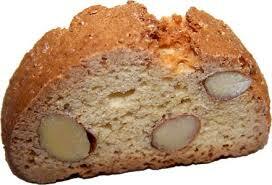 The cake may be made without the almonds and is a splendid plain white cake, very light and good. 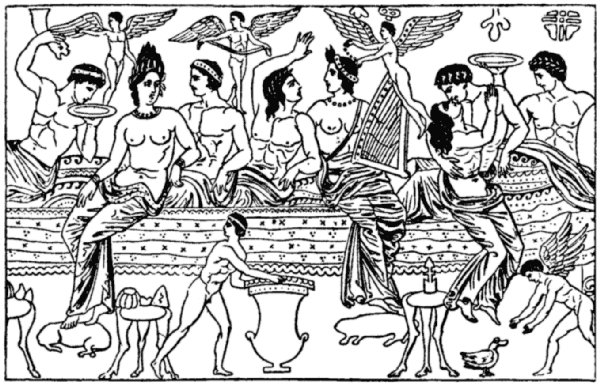 The ornamentation of the table, though limited in extent, was in excellent taste, and perhaps quite as profuse os the unfortunately small space devoted to the supper would permit. 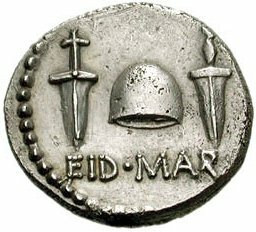 There were three leading and conspicuous pieces form the confectioner’s hands, placed at approprote points in the centre and at each end of the table; in the centre, our imposing Capitol–perfect in minature; at one end an exquisite representation of the heroic deeds of the gallant army; at the other, a similar device of the proud achievements of the navy. The representation of the Capitol was admirably executed; no detail seemed to be too minute for imitation. Even the lamps at the entrance seemed to give forth light. The columns, pedestals, cornices, frieses, entablatures, windows, situary, and the majestic dome, and towering above all else, the Goddess of Liberty, were all there as perfect as mould and model could make them. 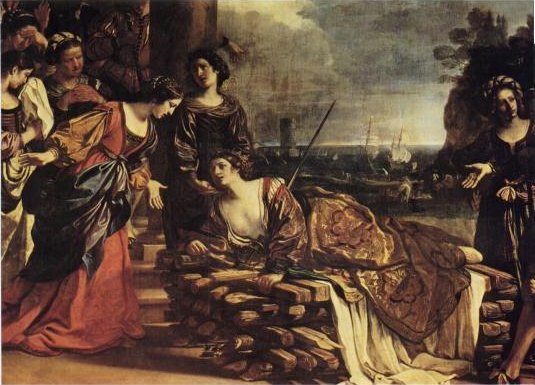 In addition, there were several allegorical representations of the progress of civilization, the genius, the arts, the sciences and literature of the day. The piece on the right was in honor of the army; and the glory and fame of the defenders of our liberty were illustrated by a pyramid, around which were clustered in tasteful profusion all the insignia of war, the paraphernalia of battle and the emblem of victory. The navy was honored in the same manner, the representation being surmounted with Admiral Farragut’s old flagship Hartford, gallantly riding the withe crested waves, while aloft might be seen the Admiral himself lashed to the rigging, emblematical of the old hero’s achievements in the Bay of Mobile; then battered Fort Sumter, the sad epitome of secession; then Neptune with chariot and trident, and the Goddess of Liberty, inspiring the brave sailor to greater glory and higher fame. There were other ornamentations, principally pyramids of which the detail is unimportant, for nougats, croquant, and chocolate are the same here as elsewhere. The bill of fare provided a select and tasteful variety, and no better idea of it can be obtained than by inserting it right here verbatim. 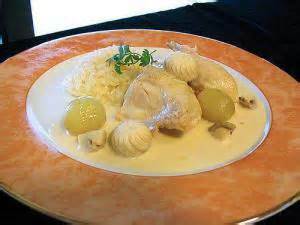 Oyster stews, terrapin stews, oysters pickled; beef–roast beef, filet of beef, beef à la mode, beef à l’anglais; veal–leg of veal, fricandeau, veal Malakoff; poultry–roast turkey, boned turkey, roast chicken; grouse–boned and roast; game–pheasant, quail, venison, patetes, patetes of duck en gelée, paté de fois gras; smoked ham, tongue en gelée, tongue plain; salades, chicken, lobster; ornamental pyramids–nougate, orange, caramel with cream candy, coconut, macaroon, croquant, chocolate; three cakes–cakes and tarts, almond sponge, belle alliance, dame blanche, macaroon tart, tart à la Nelson, tarte à l’Orleans, tarte à la Portuguese, tarte à la Vienne, pound cake, sponge cake, lady cake, fancy small cakes; jellies and creams–calf’s foot and wine jelly, Charlotte é la Russe, Charlotte à la vanilla blanc mange, creme Neapolitiane, creme à la Nelson, creme Chateaubrand, crème à la Smyrna, crème à la Nesslefored, bombe à la vanilla, ice cream, vanilla, lemon, white coffee, chocolate, burnt almonds, maraschino, fruit ices, cranberry, orange, lemon; dessert–grapes, almonds, raisins &c., coffee and chocolate. Most of it is fairly standard stuff. I’ve never had it, but terrapin stew caught my eye – very Southern. This is an old plantation recipe, published in Mrs. Fishers Cookbook. Mrs. Fisher was an illiterate slave from Mobile, Alabama. 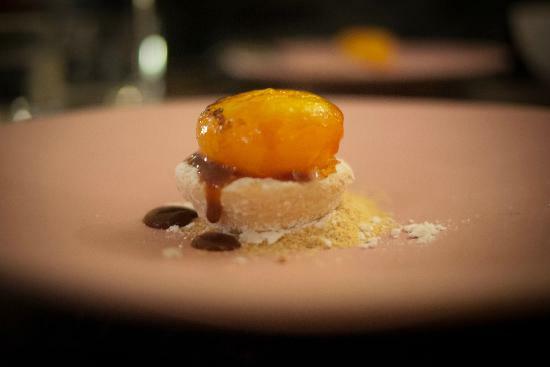 She started cooking for San Francisco society around 1870. Put the terrapins alive in boiling water. Let them remain for fifteen minutes and then take the shells from them, being careful not to break the galls. Clean the entrails from the meat, and scrape the black skin from the feet with a knife. After thoroughly cleaning the terrapins, lay then in a clear water for ten minutes, and then put then in a kettle to stew with 1 cup of water, and stew very slowly for about three hours. Boil the eggs hard, and rub the yelks (sic) to a powder. Then add the butter to the eggs and beat together until it becomes cream. To this cream add the sherry wine and mix it well. Then add this preparation to the stew very gradually, stirring well, so as to thoroughly mix it in. While the stew is cooking, mix the mustard and the tbsp of wine and put in. Slice one lemon add to stew just before dishing it up for table. 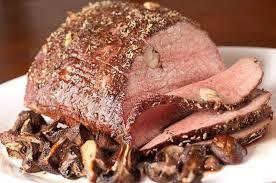 Three hours is sufficient time to cook it. You had better put the wine in the stew and not mix it with the eggs, for fear you may not mix it in right and that there may be no mistake. With the above directions you have a perfect stew. 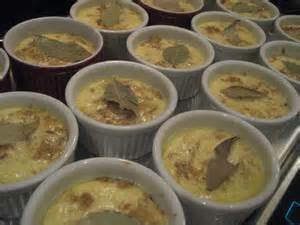 ½ cup of sweet cream is an improvement, if you like it: also the allspice.